Explain the process of a boiler cleaning. Cleaning should be carried out once a year. The maintenance-friendly design of the Pellematic enables easy and rapid cleaning. The video explains the simple and dust-free emptying the ash box of comfort ÖkoFEN. The video shows how easy and quickly the fabric tank Flexilo Compact is mounted. With the fabric tank it is possible to transport the pellets by vacuum suction from the tank to the pellet boiler. Distances up to 20 m. Outdoor installation possible. Pellet heating with storage room and vacuum suction system. Can be used where the storage room is adjacent to the boiler room. 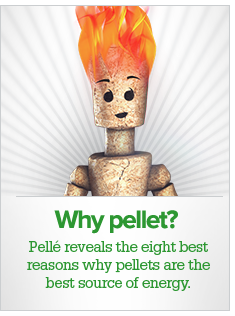 Pellets transport up to 20m is possible. Storage space can also be located outside the house. and Flexi tank with auger discharge system. The solution for a wet basement. Can be realized when the storage room connects directly to the boiler or when pellet boiler and fabric tank can be set up in a room. Pellet heating and storage room with auger discharge system. This variant can be realized when the storage room is immediately adjacent to the boiler room. The storage area must be dry and should have a pellet capacity for a year supply.